Pollution from school buses can turn up inside the buses, according to a study from Los Angeles in Environmental Science & Technology. 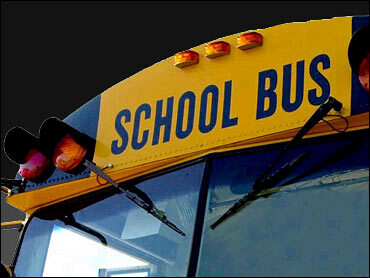 About 90% of school bus fuel consumption is diesel, say the researchers. They note that diesel particle matter "has been estimated to cause a majority of the ambient air pollution" in the area studied (California's south coast air basin). Children are believed to be especially susceptible to air pollution, the researchers say. — As a major form of children's transportation, school bus emissions represent a potentially important source of children's exposure to vehicle pollution. Scientists monitored the air inside six empty school buses while driving the buses on routes in and around Los Angeles. The highest pollution levels inside the buses were seen with the oldest models (circa 1975) with high diesel emissions and closed windows. "Self-pollution is substantial for all six buses," write the researchers, who included Julian Marshall, a PhD candidate with the Energy and Resources Group at the University of California, Berkeley. "The school bus microenvironment contributes significantly to children's estimated total inhalation intake of DPM [diesel particulate matter]," says the report. Primary data came from a study sponsored by the California Air Resources Board, says the journal. John Corr, president-elect of the National School Transportation Association, says, "The average age of school buses is much newer than some of the extremes that were used in that test." — Corr is also president of The Trans Group, a school bus fleet contracting company based in Spring Valley, N.Y.
Corr says the average age of buses in privately owned fleets is closer to eight years. Buses built from 1995 have significantly improved diesel engines that use electronics to help the engines burn more cleanly and efficiently. The researchers studied six buses on nine routes in and around Los Angeles. No students were aboard during the experiment. School bus pollution was checked with a tracer gas while the windows were open and closed. The test included buses built in 1975, 1985, 1993, 1998, and 2002. They included an older model with high diesel emissions, a more recent bus with more typical diesel emissions, a bus outfitted with particle traps, and another powered by compressed natural gas. The scientists calculated the fraction of each bus's emissions that someone in the bus would inhale. The average for all of the buses was 27 grams inhaled per million grams emitted. The highest total was about 94 grams inhaled per million grams emitted. "This may not sound like a lot," says Marshall in a news release. "But intake fraction values for vehicle emissions are 5-15 per million in a typical U.S. urban area, and about 50 per million in a large urban area like Los Angeles." The finding of comparable values is "shocking," says Marshall in the news release. "This means that for every ton of pollution emitted by a school bus, the cumulative mass of pollution inhaled by the 40 or so kids on that bus is comparable to -- or in many cases larger than -- the cumulative mass inhaled by all the other people in an urban area." In the study, Marshall and colleagues say their numbers are averages and that the results might not be typical of the entire school bus fleet, given the study's small size. Their calculations showed that "on commute days, for newer and year-1975 buses, students commuting on school buses have 34% and 70% higher intakes of DPM than car commuters, respectively," says the study. "The daily inhalation intake by a child of emissions from the one school bus on which he or she commutes is between about seven and about 70 times greater than the average daily inhalation intake by a typical South Coast resident of emissions from all school buses," says the study. Corr tells WebMD that the industry is working with the Union of Concerned Scientists and is "looking for every advantage we can" to reduce school bus emissions. "In addition to vehicle technology, there are many other choices out there," he says. "The use of ultra-low sulphur fuel alone cuts emissions. Reducing idling and the use of engine heaters for winter warming have an immediate impact." "As fleets acquire new equipment, they will be prioritized on the longest routes," says Corr. "We recognize that much has to do with school districts and what they can afford with the pressures of their budgets."